What do we really know about protesting in China? In 1989, college campuses were hotbeds of dissent in Beijing. Tens of thousands of residents took to the streets, with protests swelling over the course of a month before they were quelled by guns and tanks. The latest crop of college students — most of whom are too young to remember the tumultuous events of 1989 — are focused on career advancement in a market-driven economy, and have little time for political activism, historians and educators say. While there’s probably a good deal of truth to that description–much like the near absence of student activism in this country compared to 40 years ago–it’s not entirely accurate. In fact, as mentioned in an earlier post on this blog, “there have been numerous student-led protests in China due to poor living conditions, increasing fees and high unemployment rates for new graduates.” Therefore, it doesn’t appear to be the class of protesters that’s changed in China, but rather the issues. 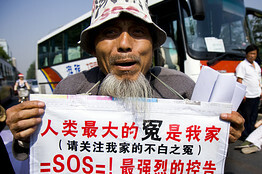 The new breed of dissidents, as the Journal also reports, are largely protesting “a range of abuses from illegal land seizures to people not receiving their social security benefits” and turning “to the central government to enlist the help of powerful officials to right personal wrongs” instead of outright condemning the communist regime and demanding democracy. According to the Journal, since these protests don’t pose as direct a threat to the Chinese government, Beijing now “tolerates” this “safer wave of protest.” But tolerate is a relative word. Only in comparison to the massacre at Tiananmen Square does China perhaps tolerate dissidents. As Naomi Klein noted in her book Shock Doctrine, “China’s activist wave has been met with the most extreme state repression since 1989.” Much of this can be seen (or not seen, as the case may be) in the form of a massive surveillance and censorship project. Even the Journal couldn’t hide the fact that its model subject for this article on the “new breed of dissidents” has had her teeth knocked out by local authorities, been arrested, and forced “to promise she wouldn’t petition the central government” even though she doesn’t oppose it. It’s fair to say that the Western media probably doesn’t have a good grasp on what dissent is really like in China. Worse yet, due to the repression and censorship of the Chinese government, most Chinese probably don’t know either. What can be said with accuracy, however, is that despite the many obstacles, people in China are persevering.